Western Michigan got its first victory in nearly a month and nearly earned a sweep over No. 12 Alaska, finishing with a 3-1 win and a shootout defeat over the weekend. After Alaska scored to open the series, the Broncos scored three straight times in the victory. Jordan Collins scored twice, including an empty-netter to seal the first WMU victory since Nov. 7, a 2-1 win over Lake Superior State. Riley Gill made 33 stops for WMU. Scott Greenham made 28 for Alaska. In the second game, Western Michigan trailed by two goals early, and then couldn’t hold on to a late lead in a 5-4 shootout loss. After Alaska jumped out to a 2-0 first-period advantage, WMU, backed by another goal from Collins, tied it up in the second. After the Nanooks took a 3-2 lead, Chris Clackson and Trevor Elias scored third-period markers for a 4-3 lead. That lead lasted until the 19:46 mark, when Alaska, aided by an extra attacker, knotted things up. The Nanooks won the shootout, 1-0, in three rounds. Gill had 32 saves; Greenham had 33. 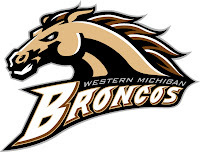 Western Michigan (6-7-3, 2-7-3-1 CCHA) has a home-and-home with Ferris State next weekend. Friday’s game in Kalamazoo starts at 7:35 p.m., while Saturday’s contest in Big Rapids begins at 5:05 p.m.